After a day on the slopes or trails, you won't have to ask twice. Welcoming living spaces feel even cozier when the fireplace is flickering. Flip it on while the kids teach you a card trick or two. The smell of bacon and french toast works like a charm. 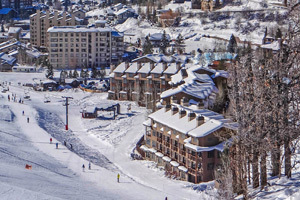 No need to rush through breakfast – it's an easy 9 minute walk to Steamboat Ski Resort. Pack up the car and head for Emerald Mountain Trail, a 15 minute drive from the resort. Spring Creek Trail is even closer. Brag about your score at Rollingstone Ranch Golf Course, just a 4 minute drive away. When you arrive at Kutuk Condominiums, the décor in the lobby immediately exudes mountain charm. Cherrywood paneling, antique alpine skis mounted on the wall, a chandelier made of deer antlers – yup, this is a bona fide Colorado ski lodge. A friendly staffer will help carry luggage and show the way to your suite, where you’ll be greeted by a condo that feels more like your own family cabin. Impress your crew by requesting a mountain-facing unit and enjoy stunning views from your large living room windows. The full kitchen makes it easy to prepare a hearty pancake breakfast, but when you’re eager to hit the fresh powder first thing in the morning you can always grab a complimentary doughnut and coffee from the lobby on your way to the base. Kutuk is a prime locale for family ski vacations. It takes just two minutes to get to the lifts (an easy walk even for little legs), so no waiting around for shuttles or hiking across icy parking lots. Steamboat Ski Resort is also home to a world-renowned Snowsports School, with everything from first-time classes to advanced clinics. There are Kiddie Corral ski and board lessons for tykes as young as two (they’ll be beating you on downhill runs before you know it), as well as a traditional daycare for tots not so keen on skiing. Wanna really wow the ski veterans in your crew? Tell them to meet you at the top of the Heavenly Daze lift at 1:00 PM – that’s where former Olympic athlete Billy Kidd holds his daily free clinic! Back home you can say you were coached by a pro. Once everyone’s had their snow fix for the day, take one last ride together down the Right O Way run and look out for the Kutuk trail sign to coast right up to the resort. Each unit has its own ski locker, so no need to track snow and slush into the suite. Head to the sundeck to unwind, either while gathered round the fire pit, or while soaking in the outdoor hot tubs. Swap stories from the slopes as the sun sets over Mt Werner. All of the two- to four-bedroom units are spacious yet cozy, inviting and clean. Woodsy accents like Native American wall art or cedar log bedframes lend the condos an Americana aesthetic fit for a rocky mountain getaway, while the full kitchen and flat screen TV make it feel like home. Comfy couches and a gas fireplace make the living area perfect for group chilling, or heated charades tournaments. At Kutuk Condos, not only are you near the lifts, you’re also right by a plethora of dining options. Café Diva and Slopeside Grill are both walkable, as is the popular T Bar. Feel like taking a break from the slopes? A complimentary shuttle is happy to take you into town to explore downtown Steamboat and the various galleries, shops and restaurants it has to offer. Little ones go wild for uniquely-Steamboat attractions like bumper-cars-on-ice at Howelsen Ice Arena or waterslides at Old Town Hot Springs. It is open 8:00 AM-11:00 PM daily. Guests that are planning to arrive after hours must contact the property directly using the information on the booking confirmation.